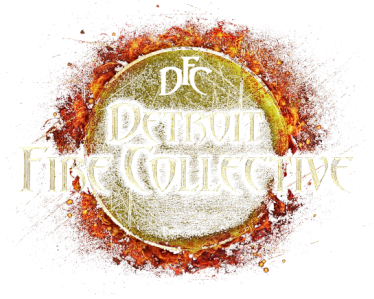 In consideration for permission to participate in DFC Activities or be admitted to DFC’s facility for any purpose, I hereby knowingly and voluntarily release and discharge the DETROIT FIRE COLLECTIVE LLC, its trainers, agents, owners, officers, volunteers, participants, employees, facility owner/operator and all other persons or entities acting in any capacity on its behalf (collectively referred to as "DFC") from any and all loss, damages, costs, liability, claims and/or causes of action arising from and/or relating to my admission to DFC’s facility, DFC sponsored event, and/or my participation in any DFC Activity (including but not limited to use of DFC’s equipment and facilities). I acknowledge that the DFC activities, including aerial arts, balancing, riding a unicycle, fakir technics, acrobatics, trapeze, juggling, fire activities, and various other disciplines (hereinafter "Activity"), involve inherent, known and unanticipated risks, any and/or all of which could result in physical or emotional injury, paralysis or permanent disability, death, and property damage. Further, I acknowledge that the risks of participating in or attending DFC Activities are open and obvious to me; and I expressly understand, accept and assume all risks attendant to the DFC Activities. I will immediately discontinue participation in all DFC Activities if conditions are unsafe or that I am unable to participate due to physical or medical conditions and limitations. I acknowledge and fully understand that such injuries, and severe social and economic losses might result not only from my own actions, inactions or negligence, but from the action, inaction or negligence of others or the condition of the premises or of any equipment used. There may be other risks not known to us or not reasonably foreseeable at this time. The specific risks vary from one activity to another, but the risks range from, among other things: The hazards of slips and falls; fire hazards; rope burns; pinches, scrapes, twists and jolts that could result in scratches, bruises, sprains, lacerations, fractures, concussions or even more severe life threatening hazards. Further risks include: damage to personal property; being struck by objects dislodged or dropped from above; musculoskeletal injuries including head, neck, and back; injuries to internal organs; the hazards from using any safety ropes, hardware, tools and equipment; the risks of falling off any equipment; the risks of landing improperly; the risks of being entangled in the safety lines; my own physical condition, the physical exertion associated with this activity and the negligence of other participants, instructors, or other persons who may be present. I hereby agree not to sue on account of any such loss, damage, costs, liability, claim(s) and/or causes of action released pursuant to this Agreement. I knowingly and voluntarily agree to indemnify and hold harmless DFC from any and all claims, demands, or causes of action, including attorneys’ fees and expenses, that arise from and/or are in any way related to and/or connected with (a) my participation in any DFC Activity (as defined above); (b) my attendance at the DFC facility for any purpose; (c) any misrepresentation by me in this Agreement; (d) any breach by me of my obligations under this Agreement; (e) any failure to comply with any legal obligation relating to my use of the equipment and/or facilities, participation in any DFC Activity, attendance and/or admission to the DFC facility; and/or (f) any claim by a third party for personal injury based or caused, in whole or in part, upon my participation in any DFC Activity and/or any and all claims resulting from damage to, loss of, or theft of property. In consideration of minor(s) listed below being permitted to participate in this the DFC Activity I represent that I am a parent or legal guardian of the minor(s) and I further agree to indemnify and hold harmless DFC from any loss, costs and/or damages arising from and/or relating to any claims or injury brought by or on behalf of minor or are in any way connected with such participation by the minor. I represent that I do not have any medical or physical condition that could interfere with my safety or health while in participating in any Activity, and that I have adequate medical and property insurance to cover any treatment required if I suffer any injury, and to adequately compensate me for any and all other loss or damage I may suffer as a result of and/or cause while participating in any Activity. I understand that in the event that I am injured, and may require medical assistance, it will be at my own expense. I understand that if I have any risk concerns, I shall discuss them completely with a DFC trainer before signing this Agreement and before my participation in Activity begins. I agree that if, notwithstanding the Release set forth above, any of the DFC Released Parties shall be found liable to me for any reason whatsoever, for any loss, costs or damages I may suffer, the total liability of the DFC Released Parties shall be limited to the amount I paid to participate in the DFC Activities; giving rise to any claim or cause of action for such loss, costs or damages. Choice of Law. In the event that I file a lawsuit against DFC, I agree to do so solely in the state of Michigan. Severability. I agree that if any portion of this Agreement is found to be void or unenforceable, the remaining document shall remain in full force and effect. Promotional Rights. I grant DFC the absolute right and permission to copyright, publish, and use photographic portraits, pictures, or videos (hereinafter “media material”) of myself, without compensation, for promotion of DFC’s circus activities. I further waive any right that I may have to inspect or approve the finished media material as long as the matter is within reason and is not deemed to be socially inappropriate. Acknowledgment of Waiver. I have had sufficient opportunity to read this entire Agreement. I have read and understood it, and I agree to be bound by its terms. The waiver and release is freely and voluntarily given with the understanding that the right to legal recourse against DFC is knowingly given up in return for allowing my participation in the Activity and/or admission to the DFC facility. You will sign this upon first attendance at the Detroit Fire Collective before participating in any Flow Jam, Workshop or Private Class.